Authors Laurie Purdie Salas and Fiona Bayrock are brainstorming about promotion during the nine months before their first books are birthed in Spring 2009. Their livejournal blog, Bubble Stampede, is full of tips and conversation about their trials, errors, and triumphs. 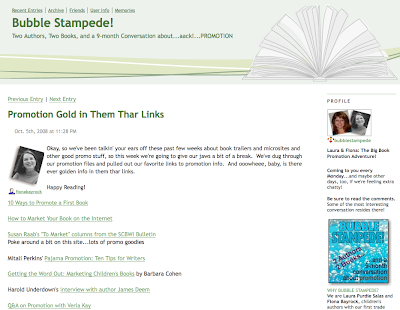 That's how I found them -- they've just shared their favorite links about promotion, included my own Pajama Promotion: Ten Tips For Writers, and Google alerts tossed their post into my inbox. I headed there for a brief visit and discovered a roundup that was so helpful I decided to share it on the Fire Escape. So here's another on-line tip for authors in flannel clutching a coffee cup: link to posts that catch your attention. Many of us track our online presence, so we'll probably end up checking you out, and maybe even buzzing about you if your content proves to be valuable to our readers.